Chassis dynamometers (dynos) determines power at the rollers (or hub interface). As part of the calculation, it uses the speed of the rollers as an input. In the simplest output format, you can display power versus road speed. For manual transmissions, for a given gear, there would be a constant relationship between engine speed and road speed and so the results can be displayed as power vs Engine Speed (RPM), a more common format. To complete the picture, torque is then back-calculated from the power results, using the formula: Torque=(Horsepower*5252)/RPM. Result is the common dyno chart format. What happens with automatic transmissions? With the torque converter between the engine and the transmission, the relationship between engine speed and road speed is no longer constant. The dyno doesn’t know (or care) that the torque converter is slipping; it will still determine power as a function or roller/road speed. So, what to do about engine speed? In addition to the “RPM per MPH” constant multiplier, setups such as Dyno Dynamics provide an option to measure engine RPM with an inductive probe (http://www.fluke.com/Fluke/auen/Accessories/Other-Accessories/RPM80.htm?PID=56651) that detects the pulses of the spark plugs. 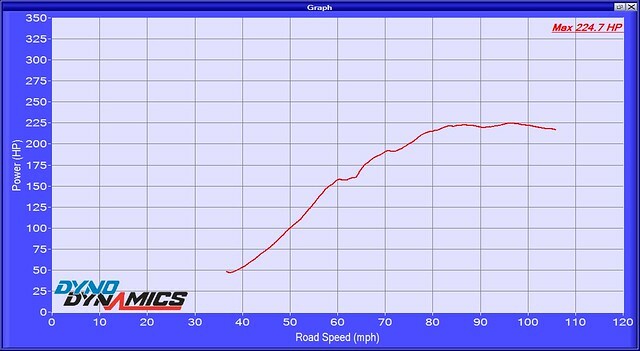 The slippage in the torque converter is apparent in the following plot, where the recorded Engine RPM is shown against Road Speed. 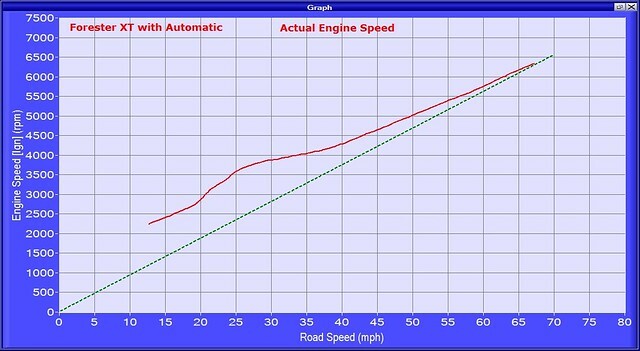 The dashed line shows where Engine Speed would be if there was no slippage. 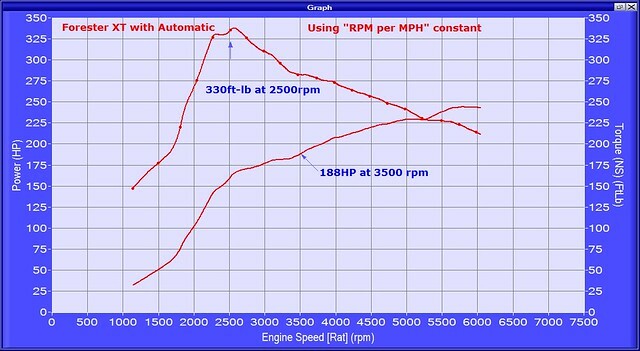 If such engine speed data not available, using the “RPM per MPH” constant to convert road speed to engine speed can lead to large errors in the results. Below are the power data plotted against measured engine speed as well as calculated engine speed. 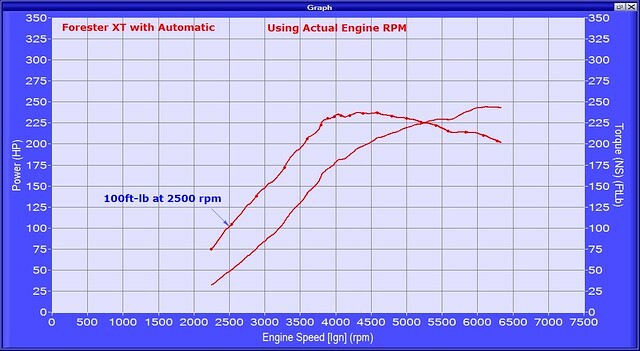 Since the displayed torque values are back-calculated from the Power vs Engine speed data, the RPM error is propagated and leads to large torque values at low RPM. 100ft-lb at 2500rpm is not as impressive as 330. 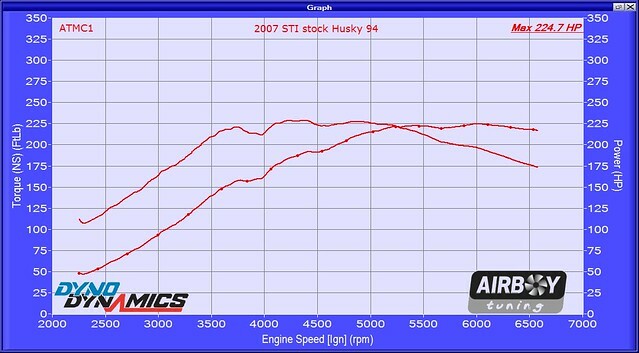 2.25″ Turbo Compressor Inlet + 3″ Turbo Inlet Hose = ?? ?